Australian golfer Brad Kennedy is set for the biggest tournament of his career. Aussie Golfer caught up with him as he prepares for The Open Championship. Kennedy has experienced plenty of high’s and low’s on most of the world’s golf tours. Born in Sydney and residing in Queensland, Kennedy has played the Asian, European, Australasian and Japan Golf Tours. But the last 12-months have finally seen him rewarded for his battle with consistency. Kennedy eagled the final hole to win the WA Open in October. It kick-started a great Australian summer, followed by qualifying for the Japan Tour at Q-School. Playing in only five events, Kennedy has had two Top-5 finishes, sits 18th on the money list and has earned a spot in his first major, this week’s British Open. In the lead up to his first major tournament, Brad was kind enough to chat to Aussie Golfer about his year to date, and his preparation for the big week at Royal St.George’s. Let’s start with the spot in the British Open. You must be excited to be playing in your first major? Yes it’s a great bonus after some good results in Japan. My first major and Stats will be on the bag. You’ve played on the European, Australasian and Asian Tours. Has the Japan Tour been a big adjustment? No. I’ve loved Japan from the first event. The courses are great with tough, tight fairways and greens running at 11 every week. Travel is easy and it’s my favourite food. Events finish at 3pm on Sunday so I can always get the night flight home to Oz and be home Monday morning. The Japan Golf Tour Organisation and the players have made me feel welcome. A spot in The Open is a rather big cherry on top of a really great last 12 months. Two top-5’s in Japan, as well as the WA Open victory. Yes it has been a good 12 months and feel that I’m getting back to the golf that saw me have success in 2003-2005. My first victory I think has opened up the shackles and allowed me to play a more aggressive game and with more control. Has anything drastically changed in that time? I have been spending more time training off the course with my coach Michael Jones, in the gym, on the bike etc., more than ever before, so I feel I’m in the best physical condition since my 20’s. I think that after Japan Q-school in December and the season not starting until April, it gave me 3 months in which I trained hard and felt my game was was ready to compete at a high level. Golfers that perform well in Australia at the end of the year often tend to go on to have good seasons. I think that if you can perform well in Oz over the summer with the quality of players we have, you can compete anywhere in the world. Did you get a sense that you were set for a good 2011? 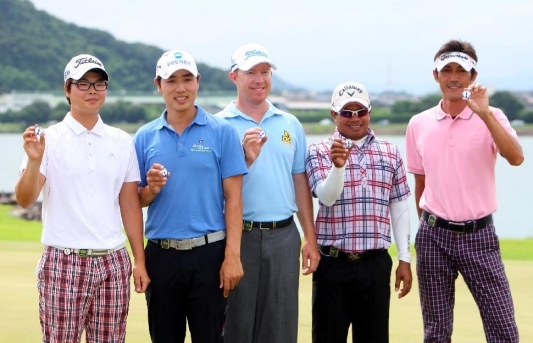 I was always hopeful and my goal for 2011 was to become exempt for the Japanese Tour for 2012. I have managed to secure my card in only 5 events which has exceeded my expectations. Now I am really looking forward to trying to finish Top 20 on the Order of Merit. Also my family life has been a massive influence, with the birth of my 2nd daughter Hannah in April. Well, congratulations! What’s your schedule like in the lead-up to The Open? I will approach it like every other week. We arrived Sunday and played a practise round today with another tomorrow. Then half day Wednesday followed by the game on Thursday. I’ll try to conserve as much energy as possible as it will be a very mentally-tough week. Do you have any huge expectations? My main goal for the Open will be to develop a game plan for every hole, which I will do after practice. That allows me to play within myself and try and execute the shots required. I’ll be playing the Japan tour for the rest of the year. I have two events straight after The Open, then home for three weeks before a 10 week stretch back in Japan. I’ll play nine of the 10 events which will take me to the end of October. My family will come with me for the last 10 weeks and travel the tour which will be a great cultural experience for my soon-to-be 5-year-old daughter Tahlia before she goes to school next year. We’ll be back in time for the Australian Open, PGA and Masters. Brad Kennedy (centre) receives his British Open berth finishing Top-5 at the Mizuno Open. Nice work mate. Good read. Hopefully he can play well and make the most of his opportunity.